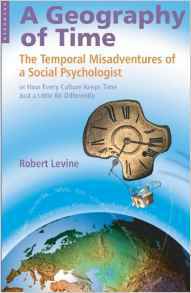 Book Review – ‘A Geography of Time; The Temporal Misadventures of a Social Psychologist, or How Every Culture Keeps Time Just a Little Bit Differently’ by Robert Levine. Now that is a title for a book. I have to admit that this book has been sat waiting to be read for around 2 years, every time I went to start it something or other got in the way, that is kind of spooky really. Anyway I took this, plus one other long awaiting paperback on holiday recently and by am I glad I did. I thoroughly enjoyed this book and unreservedly recommend it. Do not be put off by the title, long though it is, the content is superbly delivered and thoroughly entertaining. I found myself writing articles in my head to do with timing in training (obviously, criminal behaviour, understanding subcultures, a whole list of ideas leapt out from reading this. Levine does make a number of references to martial arts and I did find myself picturing my training as I read these sections. The beauty of this book is that it allows each reader to evaluate how they experience time and see how others perceive time very differently. I found the examples used incredibly interesting and enlightening, whilst Levine uses sometimes opposing perceptions of time to explore their cultural roots I found myself thinking in terms of how attackers attack and how criminals think and behave, I found myself thinking of how people construct illogical arguments against logical ideas and the reverse. This is a book about time and so much more. The actual concept of time is a relatively recent construction, still virtually unknown to some remote culture, and ironically I made time to read this on holiday. Time and how we use it dominates our lives either directly or indirectly, how we use our time is to me incredibly important so I found by reading a book on time on holiday a way of squaring the circle so to speak. Instead of reading novels like my wife I put in some valuable hours increasing my body of knowledge, my second book which I need to continue with is ‘Emotional Intelligence’ by Daniel Goleman. For the record I also completed, finished off that is, 6 draft articles for Conflict Manager magazine, held 3 meetings via Hangouts and exchanged numerous emails for CRGI and my business in the UK. Yes it was on holiday but I do holiday things when I am ‘at work’ you see the two blur for me, I am a non linear person as far as 9 to 5 goes. I have learned to see and organise time to suit myself, I think that is a central message of the book, I am a fully trained A Type for sure but I can really enjoy doing nothing, some days I simply crashed on the sunbed and in and out of the sea, pool, ice cold shower, trust me it was hot. I learned about Giri, I learned more about the brain (from both books), I learned things about tribes of people I had previously never heard of, I learned a whole ton of stuff and made a whole ton of notes, This was a holiday that I will remember for all time (sorry could not resist that). So here is a tip, a hot tip, 1 visit Croatia, 2 Take this book, 3 Make time and read it. That is it.